Santa Monica Studios’ director of photography, Dori Arazi, took time to let fans know about three pivotal scenes within their recent instalment in the God of War series, and how they came to shape the cinematic depth of the game. Needless to say, there are spoilers ahead. If you haven’t finished God of War, bookmark this bad boy and come back when you have, because Arazi’s methods are masterful. Let’s take a closer look at those scenes Arazi finds pivotal. 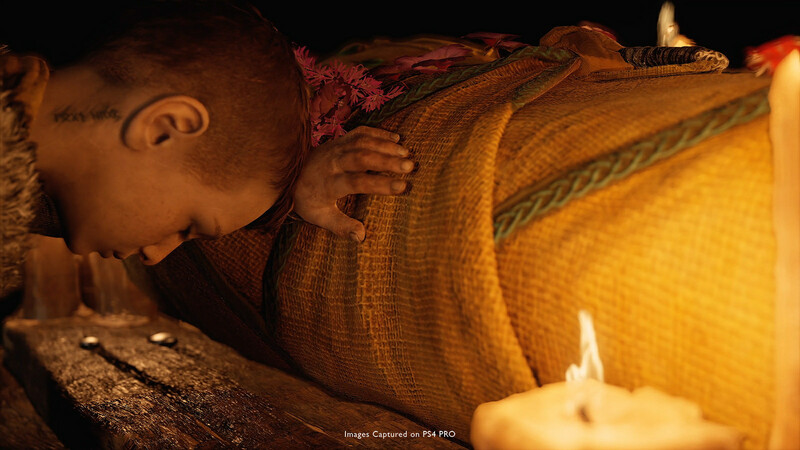 First up is the emotional exchange between Kratos and his son Atreus as they prepare the funeral pyre for the loss of Faye, the Giantess from Jotunheim. Arazi had three core empathy fundamentals they wanted to establish in order to prep the player before their arduous journey. What’s the relationship between Kratos and his son? How do they feel about the loss of the mother? How does Kratos feel about being a single father? I decided to use the blue, cold, harsh tones of the “outside” to represent Kratos, Kratos as a father (at least at that point in the story) and the dangerous journey they have ahead of them. We used this light in sharp, high contrast for punctuation. We then chose the soft warmth of the indoors to define the rare safety the mother provided, using that to portray the softer emotions. It’s easy to underestimate the important of several minutes of a cinematic, but Arazi’s task was not simple. He had to help convey the tenuous bond between a father and son grieving the loss of a mother, all while establishing what that means as they move forward and how it motivates them inherently. This is one of the more direct instances where Atreus witnesses Kratos’ past resurfacing. It is here that he realizes there is more to his father than he previously thought. Where the last two were pivotal points demonstrating key emotional components of the game’s story, the introduction of the ogre enemy-type wanted to set the bar for the physical interaction between characters of different sizes, a trait the God of War series is revered for. The scene involved real-time actors in motion-capture suits, with actors responding physically to each other despite not actually coming in contact. Once I’m done staging the scene on paper, we move to rehearsing the action in “real space.” This step was critical in order to test whether or not the paper breakdowns were actually achievable and also gave us a chance to see all the “players” involved internalize the choreography and pacing of the scene. It’s interesting to see how “slow and safe” we took things at first. You can watch the process of that very scene unfold in a clip provided by Santa Monica Studio. What was your favorite scene in God of War? Was it ultra-violent, emotional, or one of the more subtle displays of character development? Let us know, below!